Looking forward to attending the ILFI Living Future 19 Conference in Seattle at the end of the month. A chance to catch up with brilliant colleagues from around the word who are advocating and pushing for a regenerative and just future. A global community of changemakers. With a theme of Collaboration and Abundance there are a number of workshops and keynotes that are on my to do list, including; the launch of the Living Building Challenge 4.0 and the Bill McKibben and Mary Robinson keynotes. Against a backdrop of school climate activists,, Extinction Rebellion, warnings from the IPCC that give us just 12 years to avoid irreversible climate collapse, and the doomsday scenarios in Uninhabitable Earth, the need for swift progress to a regenerative future is vital. This entry was posted in comment, events, Regenerative Sustainability and tagged Bill McKibben, COST Restore, Extinction Rebellion, ILFI, LF19, Living Future, Mary Robinson, Seattle, sustainability on April 18, 2019 by martin brown. Within FutuREstorative I explored the 40% impact that the built environment has on climate change, on the environment and the people who work in or are affected by the sector. Somewhere, somehow, in recent years the built environment sector has picked up the label of being the 40% sector, based on its (mostly) negative impact on the environment. Whilst many of the 40% ‘claims’ may be seen as anecdotal, even urban myth, they are very close to research based evidence, performance data or published papers. Over recent years a number of events and conferences have been held to explore the 40% figure. Perhaps there is even a sense of pride in the 40% tag, rather than a sense of guilt. We should not and cannot be satisfied with targets of reducing carbon by 40% by 2025, for example, or reducing waste to landfill by (just) 50%, as stated in recent strategies. We need the thinking, courage, leadership and aspiration within the whole industry to turn this around – with aspirations to become the 40% net-positive sector. To consider this impossible is to view impossibility as a fact, not an opportunity or challenge. The built environment generates around 40% of all carbon emissions in the UK. 40% of a nation’s health costs are attributable to the built environment. Construction consumes over 40% of Europe’s energy and resources. Lighting represented about 25% of energy use in 2010 and nearly 40% of carbon emissions within the non-domestic sector. In 2050, capital city carbon will represent nearly 40% of the built environment’s emissions (versus 18% in 2010). Research by the U.S. Green Building Council (USGBC), the construction industry accounts for 40% of worldwide energy usage, with estimations that by 2030 emissions from commercial buildings will grow by 1.8%. This entry was posted in comment on April 16, 2019 by martin brown. Lloyd Alter in his TreeHugger post What’s a Better Term for Sustainable Design, calls for a vote between Sustainable Design and Responsible Design, citing standards such as One Planet Living, Living Building Challenge that go beyond sustainability. I have long hooked on to a comment from Yvon Chouinard (Patagonia, The Responsible Company) that we should not be using the word sustainability until we give more back than we take, and that’s more back to the environment, but also to the place and culture in which we are based, the people we live and work with, those who work for us, and the society & communities in which we live work and play. I am co-editing chapters for the forthcoming RESTORE Regenerative Design publication that also borrows much from regenerative standards, whilst embracing ecological perspectives, such as Commoners four laws of ecology. I would offer regenerative design as an alternative to sustainable or responsible design. Listening to Bruce Springsteen’s brilliant Broadway performance I was struck by his piece on 1+1=3 – this is regenerative sustainability. It’s where the magic happens, it’s the magic of rock and roll, classical music, poetry where the sum of parts is far greater than the parts. Currently buildings and products struggle to make 1+1=2. RESTORE 2018 publication (Sustainability, Restorative To Regenerative) defined regenerative sustainability as enabling eco and social systems to flourish but also pushed thinking forward, to embrace a Seva approach, where we design as part of nature, rather than apart from nature (the Eco stage). It requires a paradigm switch in how we see ourselves as part of nature. This was highlighted on my recent visit to Future Build where more than one green building supplier used the expression of giving nature a home within our buildings. Seva thinking would reverse this, to promoting green build products that nature would tolerate in its home. The abstract and papers for the forthcoming American Geographers event Nature’s New Urban Worlds: Questions of Sustainability perhaps reflects the current zeitgeist, where nature is being used in the design and forging of new urban worlds. Within FutuREstorative: Towards a New Sustainability I flagged how the language we use is important, for clarity in what we are describing and attempting to achieve, but also in the often combative adversarial expressions we use, (of competitions, wining, beating etc) adopted from business and no doubt Sun Tzu’s Art of War thinking, and that we rarely, (although I must admit more increasingly), hear words of love, caring and compassion within the sustainability lexicon. Is it ok to use the word sustainability? I will be describing the work of RESTORE and the thinking behind Ego, Eco, Seva at the Living Futures 19 conference in Seattle on 2 May. This entry was posted in Regenerative Sustainability and tagged Bullitt Centre, chouinard, Ego Eco Seva, FutuREstorative, LF19, Lloyd Alter, Patagonia, Regenerative Design, Regenerative Sustainability, RESTORE, Soul and Soil, Springsteen, sustainability on April 5, 2019 by martin brown. “The world faces two existential crises, developing with terrifying speed: climate breakdown and ecological breakdown. Neither is being addressed with the urgency needed to prevent our life-support systems from spiralling into collapse”. So starts an open letter, initiated by George Monbiot and signed by a raft of influential climate, ecology and sustainability thinkers. Natural Climate Solutions is a new initiative (website) calling on governments to back natural climate solution measures and “to create a better world for wildlife and a better world for people”. It should also be a call to us all in built environment sectors. – campaigners Bill McKibben, David Suzuki and Hugh Fearnley-Whittingstall. Recent research indicates that about a third of the greenhouse gas reductions needed by 2030 can be provided by the restoration of natural habitats, but such solutions have attracted just 2.5% of the funding for tackling emissions. This is a huge issue for the built environment sector, where costing of approaches for technical carbon reduction solutions far outweigh costing of drawdown of carbon through living systems associated with our buildings and cities. If natural living systems are even considered as carbon solutions that is, to meet our Construction Vision target of carbon reduction by 50% by 2025. Zero carbon is not enough, we can do better and go beyond zero, we don’t have time just to reduce carbon to zero. Attendees at my 2018 keynotes and workshops will be familiar with the brilliant George Monbiot narrated Yellowstone Wolf (How Wolves Change Rivers) rewilding video used to illustrate eco systems and draw out relevance to our sector. Advocacy, client and project through Living Building Challenge that drives for an ecologically robust future with imperatives such as habitat exchange, urban agriculture and more. Exploring rewilding and regenerative agriculture thinking and its relationship with the built environment. Natural Climate Solutions … a small group of people working voluntarily to raise awareness of natural climate solutions and champion the work of organisations working in this field. who encourage you to support local projects, campaigns and initiatives near you and help ensure that this crucial and exciting answer our global crises receives the attention it deserves. This entry was posted in carbon, comment, nature, Regenerative Sustainability on April 3, 2019 by martin brown. PVC, Chlorine and Building Materials – When we know better, we can do better. Having knowledge and transparency in respect of the materials we incorporate into our buildings remains a significant global social justice issue, as much as it is one of health and wellbeing. As ILFI Declare label asks, “where does a product come from, how is it used and what happens at end of its life” are vital questions in todays built environment. This aspect, social justice in sustainability, was the theme of my presentation (*) at Green Build Europe 2019 in Amsterdam last week that mentioned the social impact of PVC and the report from HBN launched the same day. On the 19th March, HBN released part two of their investigative research into PVC and chlor-alkali looking at the Asia market (Part One Covered USA and EU). This was also the focus for their webinar on 27th March. Having transparency on PVC production is vital, from both the social justice and wellbeing perspectives, if we are to create buildings that are socially justice, ecological sound and culturally rich. Moving Forward. While environmentalists, building owners, architects and designers, and building-product manufacturers differ in their opinions on avoiding PVC, there is widespread and growing support for the elimination of pollution from the supply chain of PVC and of other chlorine-based products. A public global inventory of chlorine and PVCproducers is a necessary first step for taking action.HBN is providing this report, and accompanying online materials, spreadsheets, and map, as full open-accesscontent. This data can help manufacturers to avoid chemicals derived from toxic technologies, and scientists to fill gaps in understanding the material flow of pollutants like mercury, PFAS, and carbon tetrachloride. A worrying aspect that I take away from these reports is the use of mercury, asbestos and coal in the production of chlorine and its widespread use within PVC production. products, including epoxy, polyurethane, and polycarbonate. An increasing proportion of PVC is sourced from massive new plants in the coal mining region of interior China. The highest concentration of these plants is in the Xinjiang Uyghur Autonomous Region. These government owned plants consume local coal that is inexpensive due to its abundance and low labor costs. They use toxic mercury catalysts to turn coke and chlorine into VCM for the PVC. Is forced labor involved in the mining of coal, the building, the operation, and the handling of waste, from these massive new coal-to-PVC plants? Has the industry taken any steps to ensure that PVC used in building and construction does not come from entities (including government agencies and related private investors) that violate human rights? The HBN Report can be downloaded and read here: Chlorine and Building Materials: A Global Inventory of Production Technologies and Markets. Phase 2: Asia. (with Spreadsheets, maps, and reports, all of which are free to use with attribution) Part One is also available from the same pages. Many thanks to Jim Vallette, report author and President Material Research, L3C for insights on China and related social issues. This entry was posted in comment, sustainability and tagged Chlor-alkali, Chlorine, Declare, Green Build Europe 2019, HBN, Healthy Building Network, ILFI, JUST, PVC, social justice on March 28, 2019 by martin brown. Microbiome inspired green infrastructure: rewilding the city, one human body at a time. With the first law of ecology, (and that oft quoted John Muir sound bite) that everything is connected, it is not so surprising that the microbiome in our bodies is connected to the wider natural eco-system. A topic I touched on with Specifi building engineers in Leeds recently! Yet, the next frontier in rewilding and indeed, in the evolving sustainability nexus of buildings and wellbeing could well be within the human body itself. Researchers are exploring ways to ‘rewild’ the microbiome of urban dwellers whose microbiome state maybe below par (due to urban environments and lack of nature) back a more natural and healthier state. 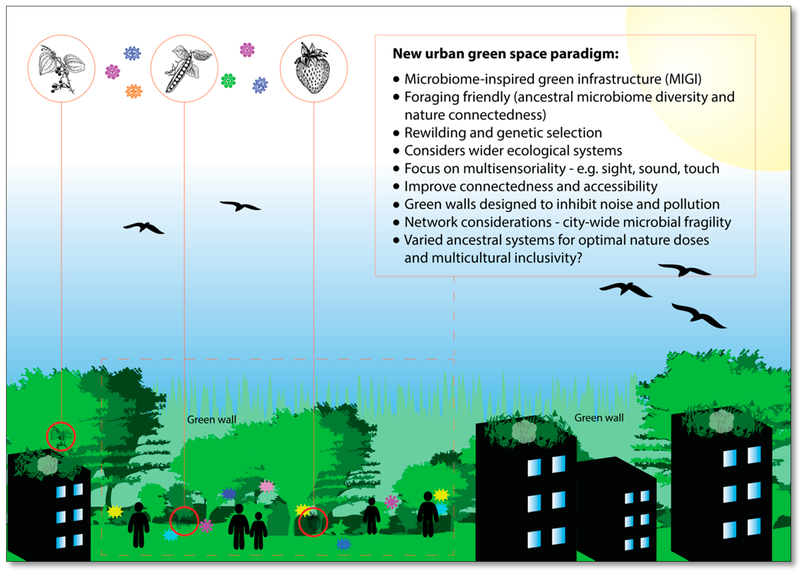 A vision for the future: microbiome-inspired green infrastructure (MIGI) and multi-sensorial, multiculturally inclusive, and foraging-friendly green spaces (created by the paper author). A call for microbiome inspired green infrastructure – “innovative living urban features that could potentially enhance public health via health-inducing microbial interactions.” – would certainly widen the project design team to include biologists and microbiome professionals. Robinson, J.M. ; Mills, J.G. ; Breed, M.F. “Walking Ecosystems in Microbiome-Inspired Green Infrastructure: An Ecological Perspective on Enhancing Personal and Planetary Health.” Challenges. 2018, 9, 40. This entry was posted in comment and tagged cities, Ecology, FutuREstorative, Health, Microbiome, Muir, nature, rewilding, sustainability, Wellbeing on March 27, 2019 by martin brown. Eco Build had been renamed as Future Build to focus on built environment innovation for the future, whilst retaining an eco, sustainability theme. From a brief attendance on the first day here are a few comments, the good the bad and the ugly. And you know what? – if this is not a common question then that raises a whole raft of other issues – not only do we not know what is in the products we promote, we don’t care enough to ask! It is increasingly recognised that our ancestors and indigenous people had, and in a few cases still have, the thinking and approaches that we know need tin this anthroprecene age to address climate change, biodiversity loss, skill loss. It was good there for to see rammed earth and clay blocks on display and in workshops. Although one can’t help wondering why this seemed to be hidden away behind timber panelling. I enjoyed the waste zone’s innovative and interactive approach. I only wish we could start calling it a material ‘conservation’ zone. Language is important, and whilst we continue to call materials waste, we will continue to see only their final destination as landfill or incineration. It was extremely encouraging to hear Sustainable Development Goals and Circular Economy given a main stage platform for discussion. If Future Build is the show case for sustainability, innovation and future-proofing – then the SDG’s, now 4 years old, along with circular economy for that matter, are a vital ingredients. Yet in 2019 the SDG’s should be common place, not new. Where then is the innovation, the next new sustainability? A few I talked with during the day, and a theme of our building hub session (What can international standards teach us?) is that sustainability is dead, it has been our engineering solution to resources, energy, climate change, carbon for 30 years (since the 1987 Brundtland definition) but the situation is now worse than then. The 2030 Agenda: Our responsibility. Regeneration and Regenerative are better describers for the sustainability we need. And given we only have another 11 FutureBuilds before we reach the IPCC impassion of irreversible climate breakdown, we have to move fast. This entry was posted in comment on March 11, 2019 by martin brown. Construction Wellbeing: exploring the 'underbelly' of construction.